Don’t let a data breach kill your business. Cybersecurity is complicated, and threats are constantly evolving. What worked yesterday may not work today, and hackers work tirelessly to stay one step ahead of anti-virus and anti-malware protections. That’s why it’s never been more important to keep systems patched and firewalls up-to-date. No longer can you “install it and forget it” — cyber-crime never sleeps. Security breaches come in many different forms. Ransomware, CryptoWall, CryptoVirus… the name does not matter – what matters is that you have a way to protect your business. Depending on the size of your company, regulatory requirements for your industry, and your risk tolerance, we can help you choose the best solution. Your people, your policies, and your technology are unique to your business. We bring the security expertise and IT background to help you protect your business. Ransom isn’t just for princesses or the wealthy. The FBI reported hackers received $250 Million in 2016 from businesses of all sizes. Unreported losses exceeded $1 Billion. If you want to avoid ransom demands, you need to protect yourself. Sure you could go “off-line”, but how realistic is that? Instead ,find out what you don’t know. Are you at risk? Preventing today’s constantly evolving security threats isn’t easy. And it isn’t something that just one tool can achieve. That’s why CMIT Secure layers proactive management and maintenance of technology infrastructure with industry-leading software and tools. CMIT Secure integrates seamlessly with your employees, your workflows, and your processes. We start with security awareness training for your staff and others with access to your systems. Then we provide your business with the right-sized security policies that align with the federal government’s NIST Cybersecurity framework. 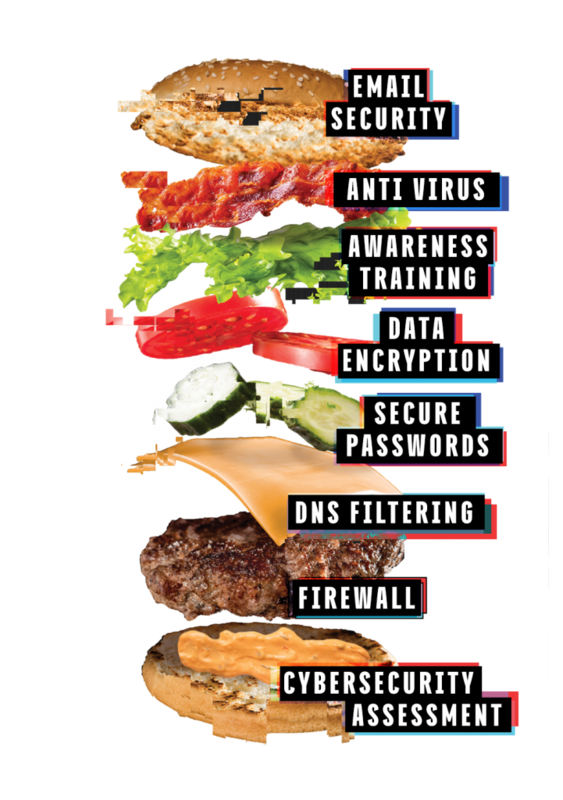 Each layer of CMIT Secure addresses a different type of threat to your business. Staff Training: Prevents human error and blocks threats. Proactive Remote Monitoring and Management: Keeps systems patched, secure, and up to date, preventing external attacks. Anti-Malware: Stops malicious software’s attacks generated by malicious links and infected online ads. Anti-Spam: Sniffs out email-based attacks. DNS Filtering: Expands your security perimeter to keep sophisticated attacks from entering your network. Password Security: Assures accounts and passwords are not compromised. Intelligent Firewall Management: Prohibits deep threats and is essential to safe business operation. Password management and protection is the first step to establishing a layer security environment for your business. Hackers aim to steal passwords above all other sensitive information, since passwords are the key to entry. The cybersecurity landscape continues to shift and change. Will cybersecurity attacks ever end? Fresh data breach reports make the news each day. Password hacks at one company can lead to devastating identity theft at another. New strains of ransomware continue to spread like wildfire. Most of us are doing all we can just to understand the threats, much less counter them. CMIT Secure™ makes cybersecurity a breeze.